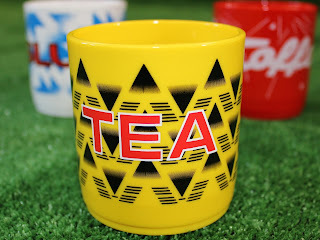 Two brands synonymous with all that's great in football, casual clothing and dare I say banter, Proper and Mundial have joined up to release a set of football related 'cult kit' mugs. Having chosen the top three clubs of the 80s and 90s, Liverpool, Manchester United and Arsenal they've done an outstanding job with regards to kit choice and sponsor likeness. Known by some fans as the 'bruised banana' the 91-93 Arsenal away jersey gets the nod, dubbed the Merson Mug with TEA where the familiar JVC once was. Sadly tea isn't my cup of tea, but the Merson mugs will be great stocking fillers in the Bossman family. In keeping with both camps' superlative content they have three videos to go along with the mugs for your viewing pleasure. The mugs were featured on Soccer AM this past Saturday morning so expect these to be very popular when they go on sale tonight at 7 PM. You can view all three videos via Proper Magazine here.